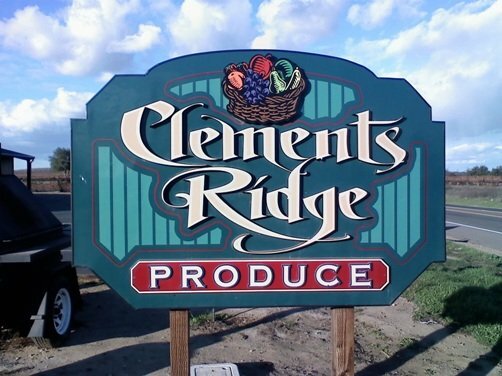 Traveling from Valley Springs, you’ll come upon Clements Ridge Produce as you turn from Highway 12 to Highway 88, and I highly recommend you stop and check it out. Family owned and operated by Mick and Jeanette McQueen, sons Patrick, who helps with the farming, Justin, who manages the store, and daughter Kristyn, who helps with the office, Clements Ridge offers a variety of road-side delights including fresh seasonal fruit and vegetables (the store is located on the family’s farm), local honey, olive oil, nuts, and munchies; as well as homemade chicken pot pies and candy. 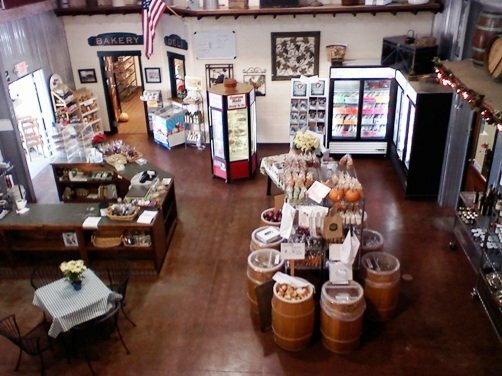 Step into the bakery and you’ll find fresh pastries and the famous Clements Ridge homemade pies. Also available in the bakery area are fresh made-to-order sandwiches, alongside a wide selection of great homemade eats; as well as a variety of drinks, including smoothies and milkshakes. During our visit we ordered two sandwiches to split; one with ham, the other with excellent tri-tip. Upon the advice of the young gentleman who worked in the store (I believe it was Justin), we tried a little something different with the tri-tip – asking to have their special mustard put on the sandwich, along with red onions, lettuce, and tomato. I think I can honestly say I’ve never had a tri-tip sandwich with lettuce and tomato, and you know what? It was delicious!! While we did not venture down the wine way, Clements Ridge has a wine room where you can enjoy a taste or two of local wines. This entry was posted on Friday, August 5th, 2011 at 11:51 AM	and is filed under Nearby Attractions. Both comments and pings are currently closed. I sat with you and your wife and John Saturday at the dinner at Ironstone. The car show went good I think for lunch they served rabbit I am not sure it was fine. I am checking out your website it looks good. I would love to stop by the farm to check it out. Plus I am thinking of using your tomatoes in my Recipe #09 Marinara Sauce. But that will be next season.